Originally uploaded by tantek (thanks Matt). Note the fact that there are not one, not two, but FOUR soap dispensing “mechanisms” here. Why? This makes no sense at all from the user’s point of view. Note: they are all empty except the bottle dispenser on the counter, so this isn’t a matter of offering a choice of soap to the hand washer. 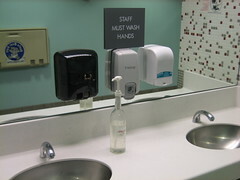 The soap dispenser market is highly proprietary, with no standards for dispenser/refill interfaces, and thus if you install a particular vendor’s soap dispenser, you have to then buy soap from them. Except when they go out of business (or otherwise fail to provide you with soap, perhaps they stop supporting a particular model of dispenser), then you are out of luck and need to buy another dispenser, probably from a different vendor. This “soap dispenser obsolescence” happened not once, but THREE times apparently for the Borders on 3rd st. between King and Townsend. Finally the staff reused a Torani syrup dispenser bottle and filled it with liquid soap (which I guess has about the same consistency/viscosity as syrup and so the dispenser “works” with either substance, which seems a bit disturbing). What’s the lesson here? Products that require proprietary refills will inevitably become useless, probably much sooner than you think. The market will eventually give up on such proprietary solutions and switch to something which perhaps doesn’t even require special refill packages, and can easily be refilled itself.